RootMetrics, a company who takes network performance serious enough to “distill” thousands of “independent, consumer-focused” tests to measure and rank them, published their 2nd Half 2014 US carrier network report yesterday afternoon. The results, well, aren’t all that different from their first half results, other than the fact that T-Mobile dropped to fourth place behind Sprint for overall performance. On top, we still have Verizon, just like we did back in August. 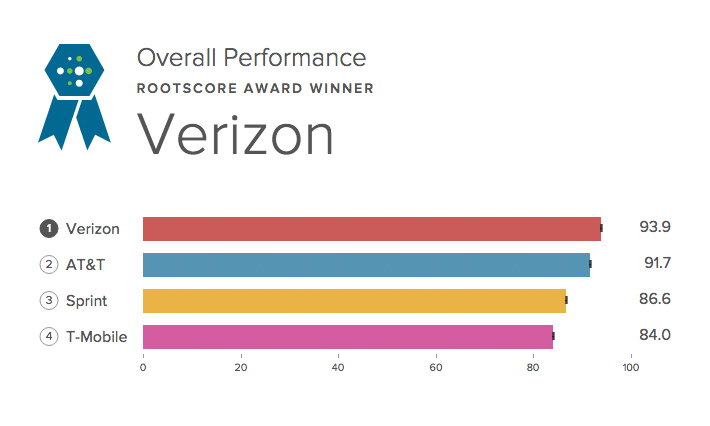 On a top level, Verizon cleaned house in just about every single major category. They won in overall performance by a full 2.2 points over AT&T, data performance by a full 3 points, call performance by 2.1 points, reliability by 1.7 points, and speed by a wide 3.5 points. The only category they didn’t capture the top spot in was text performance, which saw AT&T beat them by 0.8 points and Sprint by 0.3 points. If we look to the state level, Verizon outright won or shared for the top spot in 48 of 50 states and won or shared 257 of 300 total performance awards. AT&T was a close second, while Sprint doubled its state awards to 32. T-Mobile, meanwhile, managed just four awards, though that was up from the single award in the previous report. On a metro level, won or tied for 1st place in 113 of 125 of RootMetrics’ overall awards. AT&T, as is the case in just about every category, is a close 2nd. After that, we saw T-Mobile and Sprint in 3rd and 4th, respectively, but T-Mobile showed impressive results in overall metro areas after failing miserably at the state level. In other words, T-Mobile has clearly invested heavily in metro areas. According to RootMetrics’ report, T-Mobile moved to a neck-and-neck race with Verizon for median download speed performance, but also recorded the fastest median upload speed of any network (in metro areas). In the end, as I mentioned in the opening, Verizon killed it once again.